Medieval Legends which predominate the Arthurian Scene today, tell us that Camelot was none other than the Great Historic City of Winchester in the heart of modern Hampshire. This is not much of an area for other Arthurian connections though, so can this identification be correct? "Also Merlin let make by his subtlety that Balin's sword was put in a marble stone standing upright as great as a mill stone, and the stone hoved always above the water and did many years, and so by adventure it swamm down the stream to the City of Camelot, that is in English Winchester." "Then they departed, and within five days' journey they came to Camelot, that is called in English, Winchester. And when Sir Lancelot was come among them, the King and all the knights made great joy of him." The identity of Winchester as Camelot was, and is, further proofed by the fact that the vast Round Table of King Arthur himself hung on the wall of the Great Hall of Winchester Castle. It can still be seen there today. Modern Investigations: Winchester rests at the centre of the Anglo-Saxon heartland of Southern England. It became the Capital of the Saxon Kings of Wessex in the 7th century and Capital of all England two centuries later. It was, therefore, an eminently suitable home for Arthur also. Could the Saxons have turned his Capital into their own? Malory's equations of legendary places with more modern sites are, unfortunately, highly dubious and often easily disproved. Even Malory's own publisher contradicted his Camelot identification by claiming, in the introduction of "Le Morte D'Arthur", that the Great City was, in fact, in Wales. Earlier, Chrétien De Troyes, the French poet who first mentioned the name Camelot, actually treated Winchester as a completely separate city. Modern archaeological investigations throughout the city have revealed evidence of very late Roman occupation, though little sign of an extension of urban life into the Dark Ages. What of the Winchester Round Table then? In 1976, this became the subject of extensive scientific investigations. It was first recorded at Winchester in 1463 and had probably been painted with a likeness of Henry VIII in 1522. Now, tree-ring and radiocarbon dating methods and a study of carpentry practices revealed that the table was constructed in the 1270s, at the beginning of King Edward I's reign. This was during the period when the King had taken a great interested in all things Arthurian and had even been present at the opening of Arthur's supposed tomb at Glastonbury. The table was probably used at the many tournaments which Edward liked to hold. These were sometimes known as "Round Tables". 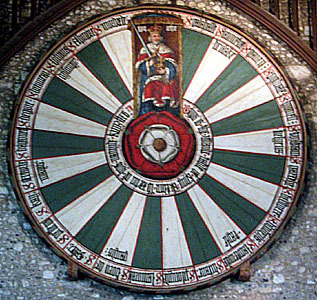 Possible Conclusions: King Arthur's Round Table at Winchester does not date from the early 6th century, though it is considerably older than many people gave it credit for. Its place in the Great Hall of Winchester Castle certainly pre-dates Malory and it may be that he was recording some confused association between the two, though Winchester was not Camelot.